When I was little, I hated vegetables. Hated them. Avoided them at any price. Would not eat them unless I was forced to, which generally was in the form of having to stay at the supper table until I cleaned my plate. And we all know how wonderfully delicious cold lima beans are. (Parents!) But now? As a card-carrying adult — and that’s an AARP card — I adore fresh vegetables and eat them any chance I get. Luckily, folks dear to my heart are skilled vegetable cooks so I get to enjoy the fruits of their labors. Such as Older Daughter, who replanted her vegetable and herb garden after the April 27 tornado near Huntsville, Alabama, pretty much flattened it. Today, less than three months later, it’s thriving and healthy and all she has to do is walk across her back yard to get makings for the lightest and most flavorful vegetable & pasta dish ever. I’m not a big fan of pasta — although I love the way Nigella Lawson says it: “Past-ah.” — but I asked for seconds of this. It was that good. 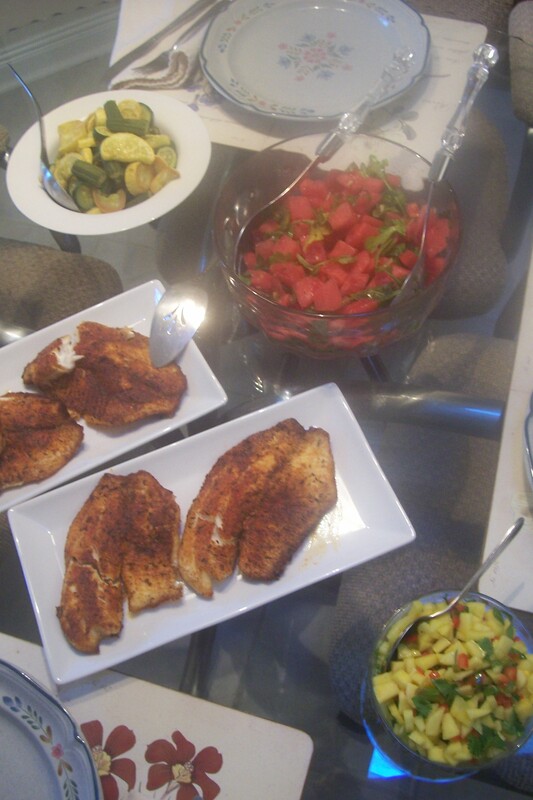 And then my friend Evelyn made a yummy summer feast that starred a cool and refreshing watermelon salad along with lightly cooked and delicious yellow squash. Now, what’s for dessert? 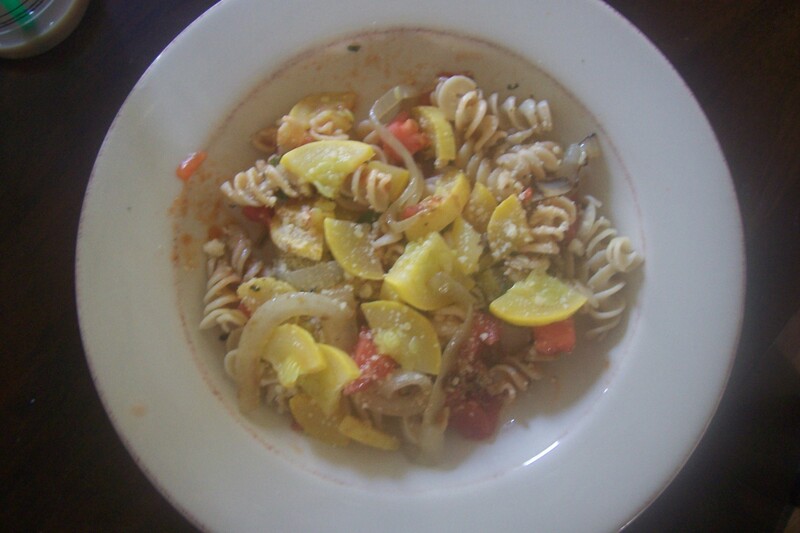 This entry was posted in Alabama, family, food, home and tagged AARP, Cook, family, food, friends, home, Huntsville Alabama, Kitchen garden, Pasta, salads, summer suppers, Vegetable, watermelon by Coffee with Cathy. Bookmark the permalink. You’re supposed to post the recipe when you brag on something that good. Mary — You mean for Older Daughter’s pasta? But she didn’t have a recipe! That’s what amazes me about her cooking: She just puts stuff together and it tastes great. I’m not sure where she learned to do that but it sure wasn’t in MY kitchen! And thanks to everybody who (not-so) helpfully pointed out that perhaps the reason I like vegetables so much now stems from that early training. Uh, no. Good try, but, no. I’m looking at you, Mom!